Surprising Health Benefits of Garlic. Intensely odorous and flavorsome, garlic is used in essentially every menu in the world. 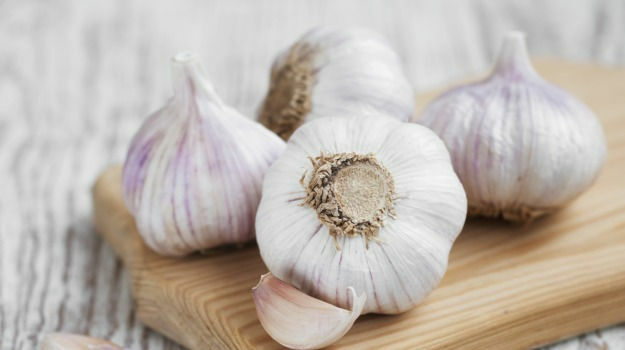 When eaten raw, it has a powerful, sour flavor to match the truly mighty garlic benefits. Garlic is particularly high in certain sulfur compounds that are believed to be responsible for its odor and taste, as well as its very positive effects on human health. Garlic benefits rank only second to turmeric benefits in the amount of research backing this superfood. Here are some health benefits of garlic that are supported by human research studies. Garlic contains antioxidants that protect against cell damage and aging. It may reduce the risk of Alzheimer’s disease and dementia. Many of garlic's astounding uses were forgotten in the folds of time but users (and believers) still vouch for the lesser-known benefits. One of them is against stubborn splinters. Place a piece of cut garlic over the splinter cut and cover with a bandage- and voila! Bye-bye splinter.